….after his confession of love towards me, and we decided to get married. Off we went on a wilderness canoe trip in the Boundary Waters, a longtime dream that both of us had shared. We got married on a small boat in what we called the “Wedding Cove,” a sheltered cove surrounded by high trees with large boulders jutting out into the water that we had fallen in love with a few days earlier while exploring. It was a beautiful morning in July, and the sun was gracing us with her presence on our special day along with a light breeze. During the ceremony a pair of eagles glided in widening circles above us. It truly was a magical moment and, of course, the highlight of our trip. The next day we took off on our honeymoon trip into the deep wilderness of the Boundary Waters where no motorized travel is allowed. It was a dreamlike experience. The profound silence brought me in touch with my very soul; I meditated with each paddle stroke in our tandem canoe. The only sound was the gentle splashing of water, the drops dripping off the paddle blade, an occasional faint call of the loon or the song of some other bird. No sign of civilization, just enveloped by pure, ancient, primordial nature. The stillness appeared sacred and I felt closer to the earth and my own deep inner self than I ever had. We found a tiny little island that we chose to pitch our tent on for the night. Again, the silence was so profound that it made us whisper as to not disturb this extraordinary experience and to honor this special gift that we were receiving. A spectacular sunset was our entertainment for the evening, a dip in the cool waters of the lake before turning in for the night, and then we were lulled to sleep by the sound of gentle waves lapping onto shore. Suddenly the rainstorm came in. Without much warning, gale force winds were ripping on our tent and both of us had to hold onto the poles to keep it on the ground. The entire affair lasted about an hour. Mopping up the tent floor and reorganizing our belongings took another half hour until we finally got back to sleep. Another side of Mother Nature is what we had just experienced, all a part of the whole, yet a little different when there is no way out except by boat. We had just gotten back to sleep when a loud splashing noise woke us up again, then some growling. A bear?? On our tiny island? It seemed he was trying to upturn our boat; although all our food was stored away in bear proof containers and hung high up in the trees, he might have caught some residue smell of something yummy and was exploring its origin. He was not interested in us at all, just tossed and played with our boat, which was our only way to get out of the wilderness, so yes, it was a little scary. What if he destroyed the boat? Or punched some holes into it? The entire event took about twenty minutes, but we knew there was not much we could do about it other than pray, and besides, it was a pitch dark night so we just sat in the tent, listening and determining if he was leaving or coming towards us. After a while we heard some more splashing and it seemed the bear had lost interest and left. Finally, we went back to sleep. We woke up early to another beautiful rose and lavender-colored sunrise. But our main focus was to check on the canoe. Thank goodness it was ok, although there were some scratches and he did turn it over, but it still was secured to the tree that we had tied it too and no holes or other devastating damage had been done. After a delicious breakfast (they always taste better in the wilderness anyways) of cinnamon oatmeal with walnuts and fresh brewed coffee we packed up everything to be back on the water before it got too hot or the afternoon rain set in. My morning meditation took place in the canoe again, breathing in, paddle stroke, breathing out, paddle stroke. The lake was calm as a mirror; the only disturbance being the ripples that our canoe left behind. We glided silently through the deep, dark water, listening to the eerie call of the loons in the distance. Our vacation continued that way for another week. The beauty of this ancient place was overwhelming and it was hard for us to even think about returning back home, but the day came to start the long four-day journey back to Colorado. When we got home things had to be figured out about our future together. Up until that time we both had not really lived together, except spending long weekends camping, traveling or being at my house. And we both had lived alone for a very long time…. 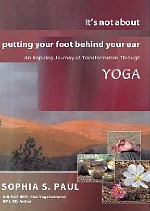 Excerpt from “It’s not about putting your foot behind your ear – an inspiring journey of transformation through yoga”. Sophia S. Paul is a Naturopath, Reiki Master Teacher and a Certified Yoga Instructor with 30 years of experience. She is the author of “It’s not about putting your foot behind your ear – an inspiring story of transformation through Yoga”. Her book demonstrates how the simplicity of yoga and a holistic lifestyle can transform your life into one of peace, health and happiness. 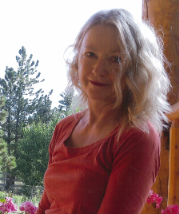 She deeply loves nature, and lives in the Colorado Mountains close to her children and grandchildren. Connect with Sophia on Facebook and view her book trailer here.